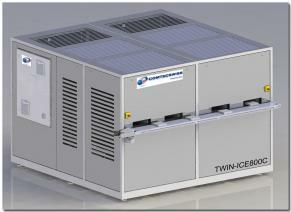 TWIN-ICE - Slices and Blocks. A unique Dry Ice Technology which provides high reliability, 50% Redundancyof Production with a capacity up to more than 800kg/hr with one unit only. Two completehydraulic drives into one unit. Small and easy to install - no modification of the building. 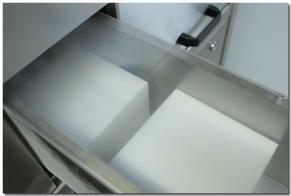 Various thicknesses of dry ice can be produced with our TWIN-ICE Technology. 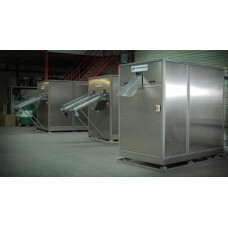 150x150 or 200x100 or 210x125 etc. Growing with your Business - Upgreadable! Slices and blocks always at your command ! The most reliable Dry Ice Slice Maker for Airline Catering Services. Designed to produce 800kg of slices in one hour. 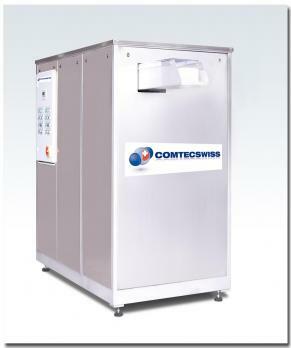 4 Dry ice machines in 1 Unit.